Well I've bit the bullet and decided to put 18inch collars on my Welsh seedling leeks outside due to the fact they are putting on loads of girth but are not going up at all. 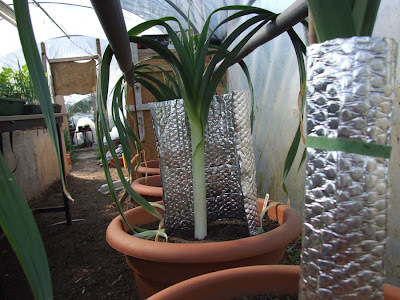 All my pendle leeks are now at least 13 inches to the button so i will keep them on 15 inch collars until they reach at least 15 inches in length and 5-6 inches around. 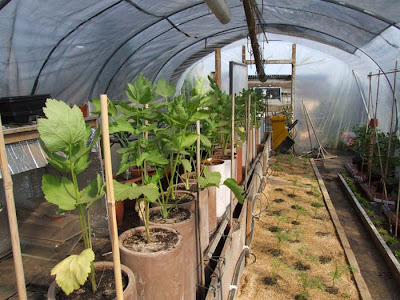 I'm really confused as to why the Welsh seedlings are not going up and its now crucial i get the length, even if this means replacing the 15inch collars at a later stage. Still massive concerns about the footrot that could destroy my season along with a few other things i will throw about the place. Onions are living in a pond because the river nile burst its bank again this year.. probably all screwed will know in a few weeks time, from experience they are screwed. * Firstly don't bother growing exhibition leeks from seed if you want to compete with the best. A leek grown from seed could produce 1 decent, dead straight, good size, virus free leek from 100 planted and this is initially how leeks get reselected. * Grow your leeks from bulbils also know as pips, grass. These are basically a leek taken from the seed head of the mother plant that will produce the exact same characteristics of that leek. Leeks are reselected for size, quality and the amount of virus they have in them to produce the best possible leek year after year. At the end of the season/after the show, you put your best leek back to seed for re selection if it meets the standard of being a perfect leek. This is done by cutting the roots of the leek and cutting about 6 inches up from the root plate to form a 6inch leek cutting. This is then planted back up in a pot and after a few weeks it would have rooted and the center of the leek would have started to push up. At this point all the extra foliage/skins is removed until you reach the main core that has pushed up, this is done because by Christmas it would have rotted off anyway. Continue to grow the leek on and pot up as needed, some people actually cut the flags off to save energy for the plant seed head, I don't as I havent seen this in action and I'm not 100% sure when you cut the flags. Eventually you will end up with what looks like an ordinary leek and by March/April time will produce a seed head. Once the seed head shoots up you need to support it to avoid it breaking as they get pretty top heavy. Eventually the seed head will open, but its not the seed we are after and this part can be tricky in judging to avoid the bulbils coming to soon. The idea is to let the seed head form until you reach the stage when you have a full seed head and maybe the odd grass on the head. Its called grass because it looks like grass but in actual fact that is a leek. Once at this stage you cut all the seed and grass off the head and throw it away as it isnt fully formed it wont be any good. You need to be quite serve and cut it right back as it you were giving it a hair cut. The plant will now go into overdrive and will use all its energy to produce grass/bulbils as it has lost all its seed. You will end up with a head full of bulbils that i call baby leeks that you can grow on to produce the exact same leek as the mother. for 24 hours, (the thick concentrate is best that you mix with water). This is done to keep the bulbils clean and pest free to get you off to a good start. After 24 hours the bulbils will part off the head quite easy and you can then plant these up in a peat based compost id suggest to start, on a warming mat/cable to get the roots started. After 2-3 weeks they should have rooted nicely and can then be placed under lights for 14-16 hours a day until about the end of Feb. Along the way you need to support them to keep them straight, keep them moist and spray for any pests. I always pot my leeks up in john innes no.2 and always ensure they never get pot bound to avoid low nutrients and stunted growth. You are looking to grow the leeks on in pots until the end of April/May or until the weather has started to improve ready for planting. Depending on growth depends on the collar but i never use to collar my leeks until i planted them in the bed.This year as i was told the Pendle leeks need pulling a lot sooner upwards to get the length, so i collared them while still in the pots but you can read that on my other blog posts. One little tip to mention is the actual length of the barrel that is blanched and the leaf itself, it takes approximately 8 weeks for a blanched (white) leaf to turn green and you really want a minimum of 15 inches of pure blanch barrel. The problem you have is blanching the flags to high up resulting in 3 inches of flags being blanched aswell. Depending on how fast your leeks are growing compared to girth is when you need to decide if you use an 18inch collar or stay with a 15 inch. A little trick can be applied but only if you have time in the season as you need to leave at least 8 weeks for the flags to green up again. The idea is you apply an 18 inch collar which forces the leek even further upwards but 8 weeks before the show you reduce the collar back down to 15 inches which results in length and green flags at the start of the blanch. 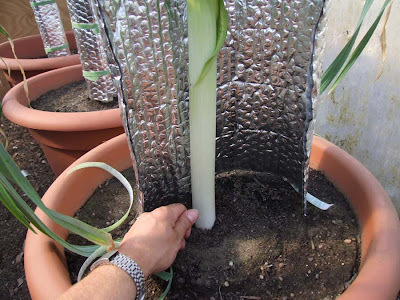 I never feed my leeks while in there pots and will only feed if i feel they really need it or are struggling while in the beds. So thats the hard way of producing your own reselected leeks, but for all those who can't be bothered with that or want to start with a good strain you should order yours in from a well know respected expert grower such as medwyns. This year i ordered mine from medwyns (as i lost all my leeks last year) and they came 3rd December, from which point they are grown on as stated above under lights. 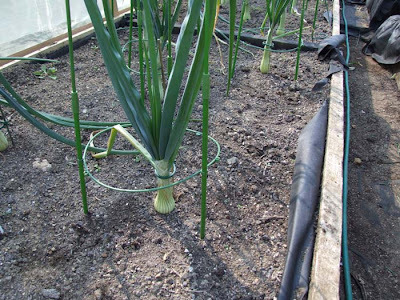 The Pendle leeks inside the tunnel are growing very fast compared to the welsh seedlings outside in the raised bed. I really need to sort my leeks out that are outside and tighten the collars maybe as they seem to have stopped going up. The massive concern i have is Fusarium foot rot which is a form of fungus affecting the crown of the leek turning it a brownie, yellow colour which i have on some leeks. This is spread so easy and lies in the soil with no real solution except hope it doesn't effect your leeks to much. All i can do is remove infected flags and spray with fungicide, so far it hasn't been to bad..fingers crossed. These are quite mature leeks tho, so i hope they can live with it. Well most of the long carrots have now come up but still some stations refuse to germinate, this may well be due to the mix being so fine that when watering the seeds sunk down to far. 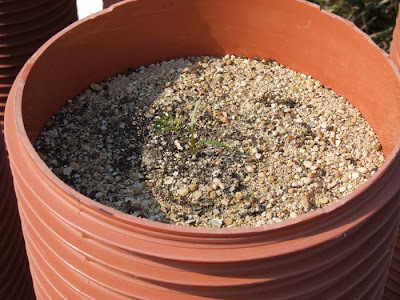 One thing i did see in GardenNews is planting carrots in toilet rolls first and carefully planting them out. Carrots wont stand being pricked out as you will disturb the tap root, but maybe this is something to try next year as in theory the carrot wont be disturbed and planted straight into the pipes. Germination inside the tunnel would not be a problem and then I'm near 100% guaranteed germination without wasting 4 weeks..One to try maybe. Well my 2nd and 3rd sowing of celery is still alive and a few of my 1st sowings managed to pull through after most of them died due to a heatwave. 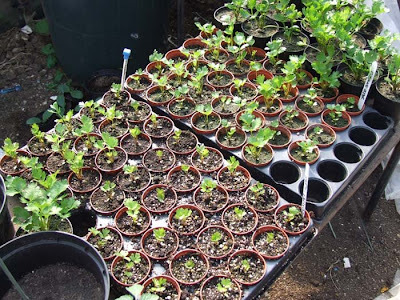 These are nearly ready for there 3inch pots and will hopefully be planted out mid June. Id normally be planting out end of May but i just have to hope these will make it on time. The onions are growing away nicely now and have put on a lot of weight since planting out. I have noticed tho that the onions behind the enviromesh are growing much better then those without it, so this weekend I will buy some more to finish the job off. 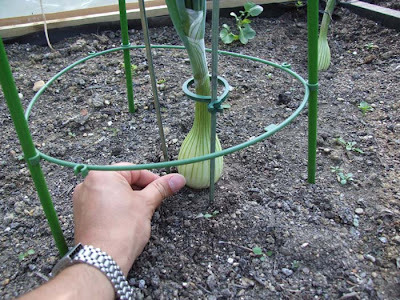 The largest of my onions has decided to go double necked which means it will split like a shallot, this wont matter as it should still reach quite a size and will be heavier than my single onions so might make it for the heavy onion class. I don't grow for the heavy onion class and its not well contested at the local shows so we don't bother, but last year a split onion won so who knows. 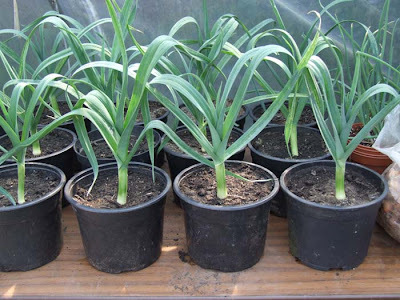 If you are interested in growing the heaviest onion then kelsea onions is not the choice, even tho they reach a big size they are grown for quality aswell as size, you should grow Ailsae seedlings that you can buy from http://www.exhibition-seeds.co.uk . From past experience there customer service is rubbish and delivery time useless and half the time they fob you off with some rubbish about everything died so we cant send your order, but maybe worth a shot next year if your interested. All of my Kestrel potatoes came up a few days ago and some Winston popped up today, just waiting on Nadine and Cara to show. 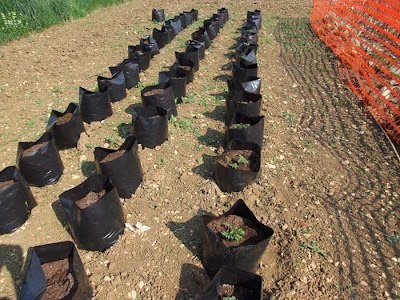 I will add more peat to these bags when they reach about 6 inches in height. I don't think I'll grow this variety next year as they really have struggled from day one and are still looking months behind. I just re-potted these up into there 2 litre pots as i have been ignoring them for weeks with disappointment. I have some early runner beans in, yes these look a bit early so i need to keep an eye out for any late frosts. With such wonderful weather we have had i thought id plant them out as they were getting a bit pot bound. 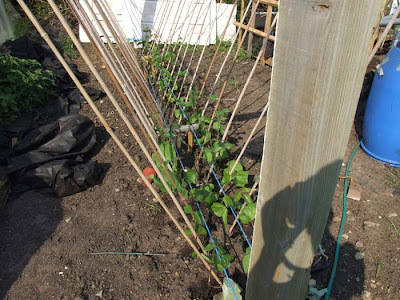 I have also sown a few seed for a later crop and as you can see i grow my beens upside down compared to the normal method resulting in the beans hanging down making them easier to work on. 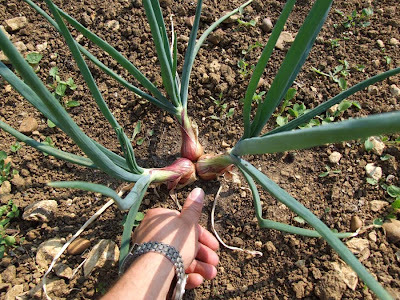 The shallots in the allotment continue to grow well and are getting pretty big now. I have been teasing them apart to ensure they have room to grow to avoid any flat sides. Most of the shallots are now thinned down to 2,3,4 bulbs, mostly 4. Now i just need to keep an eye on them to make sure they are still growing by looking for new shoots coming from the center. 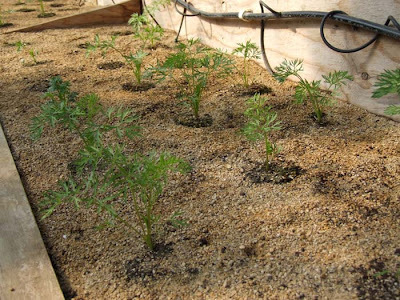 Carrots inside are doing pretty well now, some stations still have not come up so i will re-sow them again soon and get some later ones. These carrots are ahead of my long carrots, kinda worrying lol.. they will be fine I'm sure, I planted them the same time last year and they were crackers. 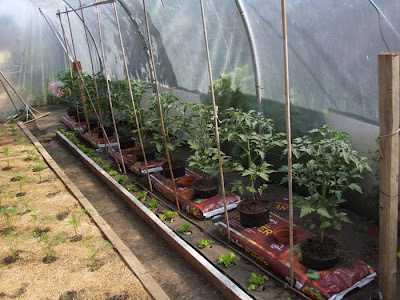 I've managed to get my 10 cedrico tomatoes all planted up in there grow bags inside the main tunnel. Another 20 or so tomatoes will be planted up later in one of the other tunnels when we find time to prepare it. As you can see we are using grow bags with two tomatoes planted in each with a 5 inch watering hole in the middle. 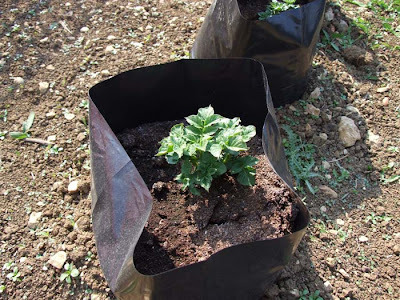 The tomatoes are actually planted in the bag in there final pot (5litre) with the bottom cut off to give just a bit of extra depth, use florist buckets if you have them. All the watering is entirely done via the 5inch pot sunk into the middle of the grow bag. The tomatoes need regular checking, tying, side shoots removed and feeding once a week once the first sign of tomatoes start to form. I have to say these tomatoes are flying under the conditions they have been given and i only hope they don't come to early. A look inside one of the tunnels that i grow my parsnips, short carrots, leeks, 10 tomatoes and some cut and come again lettuce. This tunnel is just about cleaned out and everything planted up, just a few more things to tidy away and i can sit back and watch it all grow.